For other running routes, see Routes List. Pictures courtesy of Google StreetView. NOTE: Remember, Singapore is in the tropics, and the climate is muggy: expect very high humidity, so try to run in the mornings, when the air is coolest. I love Singapore now, but my first impression of the city/country was that the city-state was, so to say, a bit boring: A downtown full of sterile banking high-rises, but not much life in the streets, everything a well-oiled money machine. It was lacking the funkier evening street-life that you can find in Hong Kong, and there was nothing there to compare with London's West End for entertainment. It seemed even more suspect to me when I saw how Singaporeans liked to spend their evenings strolling on Orchard Road, which is basically a string of shopping malls. Why anyone would want to spend their free time in a mall has always mystified me. All in all, my judgement was that the breathless redevelopment of the town center had created one new sky-scraper after another, but somehow none of them seemed to touch the elegance and human-proportions of the old, British colonial architecture. But I had to admit, it was all, well, very pleasant. Landscaping has been lavished on every corner and along every street. There are nice parks and lots of waterfront. Everything is clean, crime-free and, there's that word again: pleasant. Singapore learned from the British to adorn their bridges and public places with flowers, but with a decidedly tropical, exotic flavor. I would have named the city Pleasantville, if anyone ever asked me, not that anyone is planning to. And now the Singapore city planners have decided to make the town more lively. In the last few years, they have been building new theaters, tourist attractions, stadiums, casinos and golf courses at a furious rate, all concentrated around the Marina Bay area. 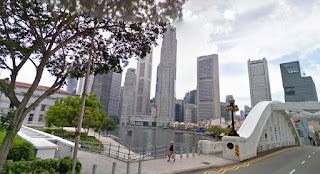 The north end of Marina Bay has been built up with the Esplanade theaters and a whole quarter full of modern office buildings, shopping, hotels, etc. along Nicoll Highway. It looks like Lisbon's Oriente quarter, the ex-World's Fairgrounds, and it has been topped off with a London Eye-ish ferris wheel, the Singapore Flyer. And the town seems to be genuinely a more fun place to be, but still remaining really pleasant. It also took me a bit of time to discover that the older neighborhoods to the east and west of downtown have a lot of charm and variety: it's an ethnic mix with a blending of lots of interesting sights and smells. You'll find shops with signs in Chinese, Arabic, Hindi, trendy boutiques, one after the other. There are Tao temples, Buddist shrines, mosques, Hindu temples and churches all in a row. 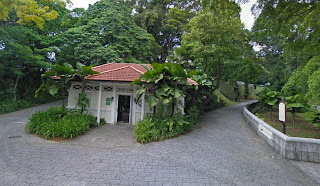 So, now that I finally learned to appreciate Singapore, here's a running route that visits a lot of this stuff, and lets you discover all the pleasantries awaiting you in this very pleasant place. 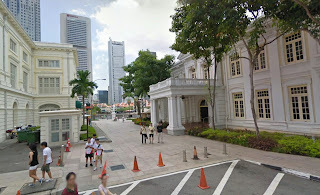 We'll do a loop through the city center, from Outram in the southwest to Kallang in the northeast, zig-zagging through the most interesting neighborhoods. And where's a better place to start than in the heart of town, at Bridge Street on the Singapore River. With the parliament building across the bridge, you'll see the line of bum boats (ex-river barges, now tourist tourboats) lined up in the river. Along the riverfront on the right, on Boat Quay, is a line of waterfront restaurants and pubs in colonial-era row-houses, my favorite place to spend a warm Singapore evening. Run straight down Boat Quay, with the water to your left, until you come to that great old Victorian suspension bridge, with the grand old Fullerton Hotel on your right. Turn left and run across the suspension bridge. 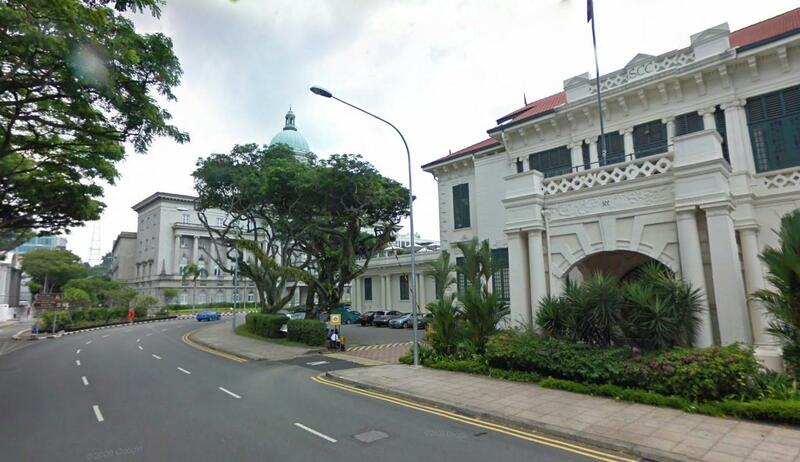 You will run right towards the Asian Civilizations Museum in its restored government building. On the other side of the bridge, turn left and run along the water to the statue of Sir Thomas Raffles, the city's founder, at his original landing spot. Then turn right and run along the sidewalk between the museum and the old parliament on your left. You'll then run along the backside of the Victoria Theatre. After the theater, you'll come out onto St. Andrew's Road, with the classical Supreme Court on the left, and the cricket club and its playing fields on the right. Run straight ahead, with the cricket fields on your right, and you'll see the fly's-eye-looking Esplanade theaters and the new Marina Bay development to the right. When you cross Bras Basah Street, you'll see famous Raffle's Hotel on the left. 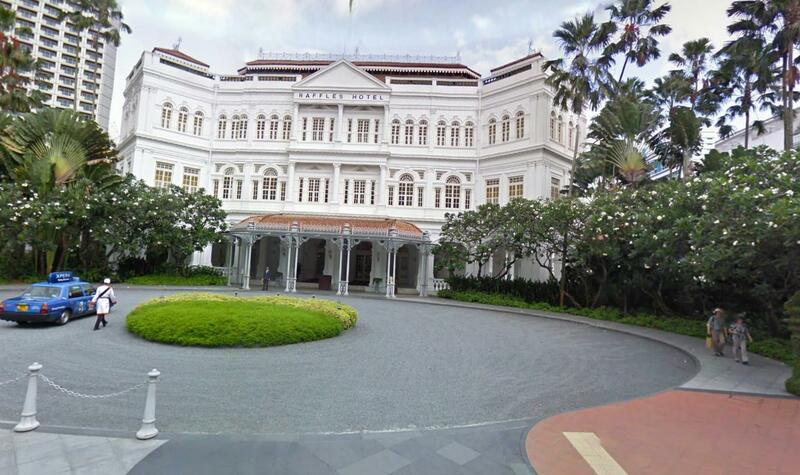 (You'll also soon notice that half of Singapore is named after Raffles). The road is now called Beach Road, but continue jogging straight until after you cross Ophir Road. Here, in the Kallang neighboorhood, there are a lot of older, narrow streets full of exotic flair. The neighborhood is also home to lots of backpacker hostels nowadays. 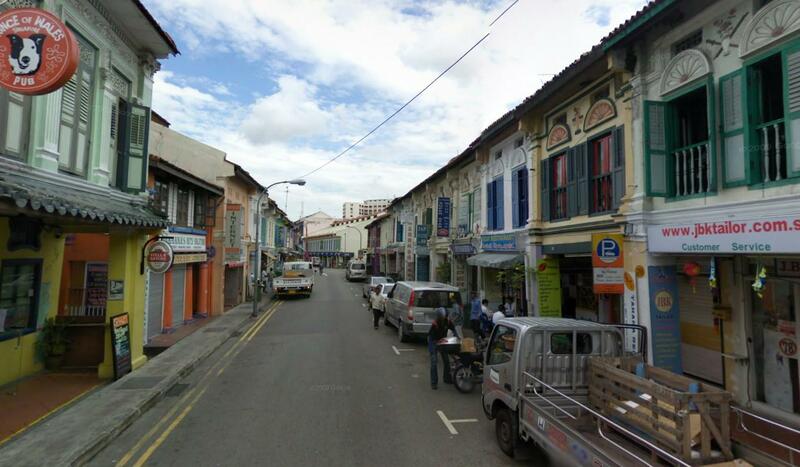 Turn left on Arab Street, which is famous for its cloth-sellers and clothing shops. You'll soon see the colorful Sultan Mosque to the right. I actually like the street best a few blocks later when it changes its name to Upper Weld Road, and isn't famous for anything in particular, just a normal neighborhood. When you get to Kampong Kampor Road, turn right and run a few blocks to Veerasamy Road, where you turn left. You are now in Little India. 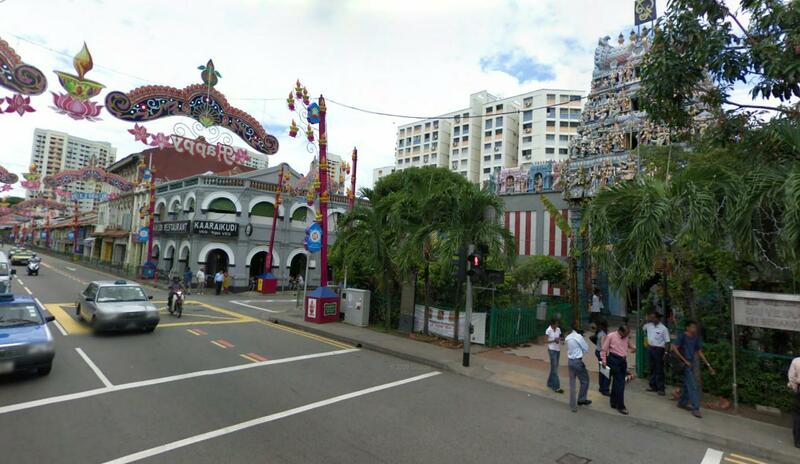 When you get to the next cross-street, Serangoon Road, you'll find a fantastic Hindu temple. Turn left here and run 3 blocks to Dunlop Street, with its jumble of shops, backpacker hostels and homes, where you turn left and run southwards again. After a couple of blocks, you'll pass another interesting mosque. At Jelan Besar, Dunlop Street ends, so you turn right and run for 2 blocks. When you see a pedestrian bridge over the street, turn left into the lively pedestrian street, Albert Street. Continue to Queen Street, where you turn right, at the spot where all the rickshaws are waiting. 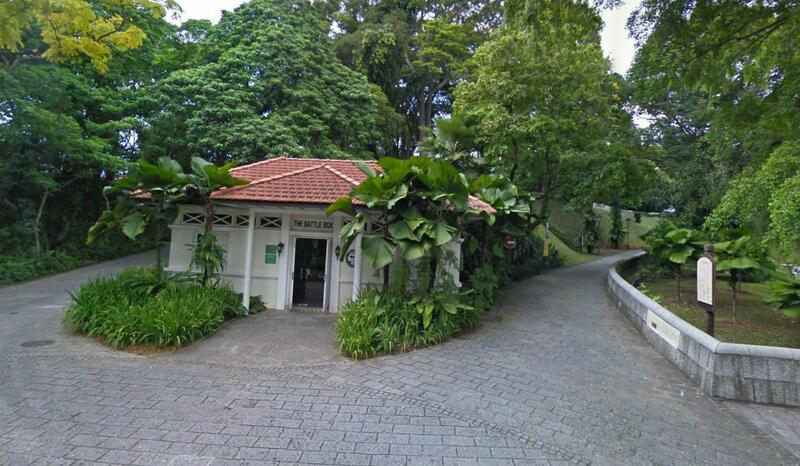 Run straight down Queen Street until you hit one of Singapore's nicest parks, Fort Canning Park, located on a small hilltop. Queen Street runs into Canning Rise, where you turn right and run past the state archive building, then turn left and run up the hill into the park. There is lush vegetation, a small lighthouse (a bit far from the water here! ), thick fort walls and a nice spot to run. Loop through the park and exit near the radio tower, running east at Hill Street. Cross Hill Street and run the one block to North Bridge Road, where you turn right, with the new parliament on the left, and run one block back to the bridge where we started, 7.5 kilometers earlier. After a shower, you should visit this spot again and drink a nice cool Tiger Beer at the riverside!